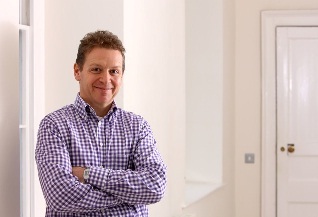 How do you get employees engaged in your wellbeing programme? This is some of the feedback we get from HR on the frustrations they have with their wellbeing programme. This is not surprising, health and wellbeing is a major challenge for society with no silver bullet. The workplace is an essential component in reshaping lifestyle habits and HR should be given as much support as possible. No single solution works for everyone. So from HR’s perspective then no one approach is going to accommodate every employee. You will need different strategies for different employees. In a previous article we looked at the stages of health change. An employee can be in different stages for different health risks. For example, someone might be ready to give up smoking now but has no interest in changing their alcohol habits. 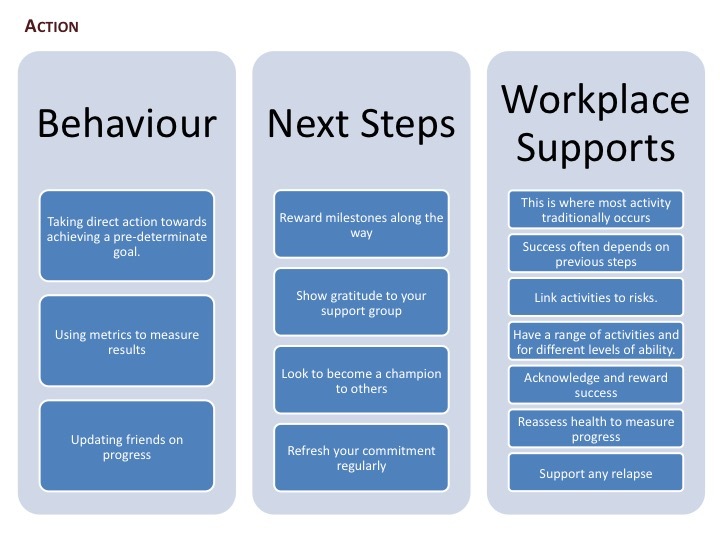 So, an effective wellbeing programme needs to recognise each stage and support employees as they work through this process. Stage 1 – Not ready to make any change. Typically people at this stage for a heath risk are either in denial or are not aware of the problem. They often feel resigned to the risks or are not aware of the consequences of their actions. Communication is a key component of the wellbeing programme to move employees beyond this stage. It needs to encourage employees to rethink their behaviour, promote honest self-analysis and explain the risks of current lifestyle choices. 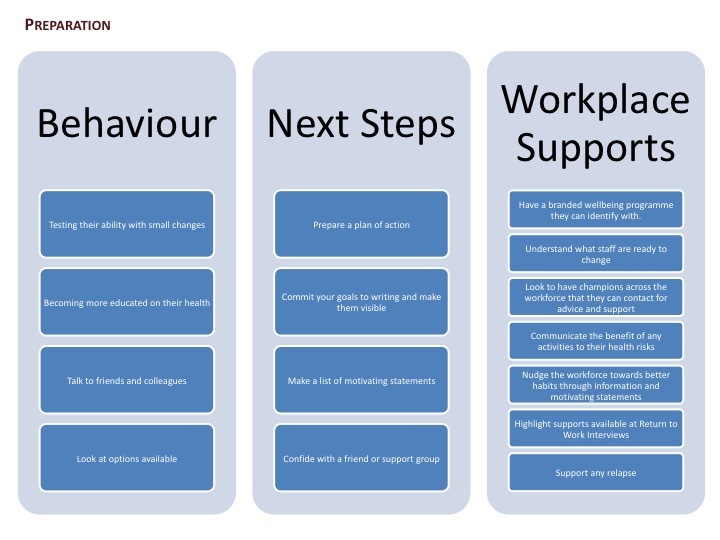 Get staff to assess their health and identify the areas that they are not at risk from. Give them support when they are sick and point them to the most appropriate pathway as quickly as possible. Empower your line managers to carry out effective return to work interviews. Make sure the employee is aware of all the help that you provide. You are becoming aware that you should make a change but the perceived costs outweigh the benefits. Because of this uncertainty, this stage can lasts months if not years. In fact many never leave this phase. This is a really important stage of a wellbeing programme to focus on. You need to persuade staff that the pros of making the change outweigh the costs. Give them the confidence that they have the ability to succeed. Identify and understand the barriers that might be hampering staff and look to break these down in the workplace. It is important that staffs are aware of the supports available. This starts when they are not well. Have a back to health, then back to work policy for absence. Give line managers the tools and confidence to perform effective return to work interviews. At this stage a person is getting ready to make a change. They are gathering information and maybe even making small tentative changes. The wellbeing programme needs to help them take the steps that will improve their chances of successfully making a lasting life change. Have motivating statements and goals visible. Encourage champions and support groups within the workforce. 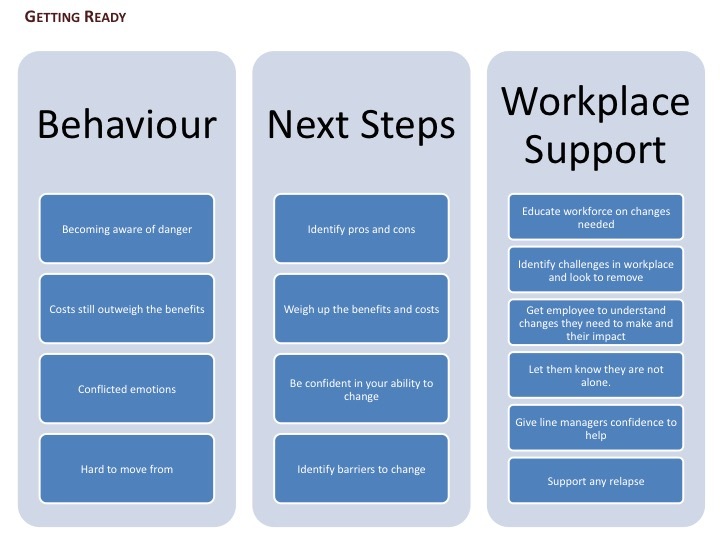 Train your line managers to identify when their team might need support and offer advice and encouragement. At this stage individuals begin to take direct action to make a change. This is where many programmes concentrate their efforts. However, without giving enough time to the previous steps this action may end in failure and your engagement numbers will fall off. Make sure you congratulate and reward those that are taking positive steps. Allow them to review and track progress to reaffirm commitment. You are maintaining your new health behaviour and are becoming confident that you will continue them in the long term. You are aware of temptations and look for ways to avoid them. The workplace programme should be nurturing a culture of health within an organisation, reducing the temptations for staff to fall back into bad habits. Encourage employees at this stage to become champions for their colleagues. 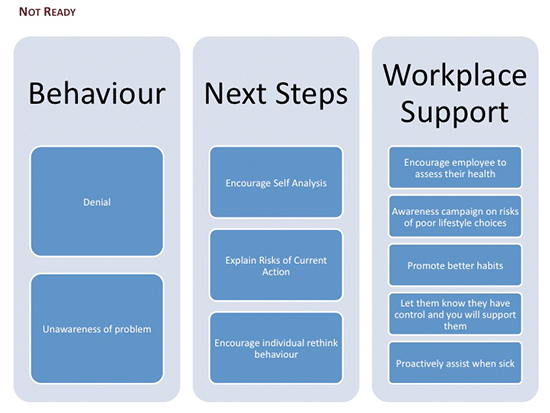 Make sure that their new behaviour is appreciated and valued within the organisation. Our health journey is not going to be linear all of the time. We are going to fall back into old lifestyle choices. Make sure you are not too hard on your self and don’t give up completely. Dust yourself off and get back on the saddle. 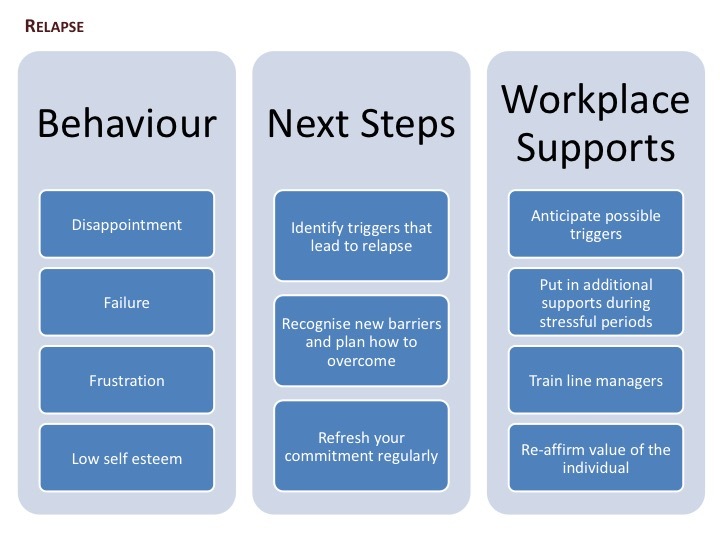 The wellbeing programme needs to look out for the triggers that might lead to relapses within your organisation. Are there stressful periods where staff needs additional support? Look at these obstacles and see where you can avoid or overcome them. A workplace wellbeing programme needs to be multi-layered across different health risks and demographics. Make sure you are providing your workforce with the information, awareness and tools to understand where they are and what steps they need to take. Your take up of initiatives will then grow. I hope this was of help. To find out more, check out Health House.